Portable Cantilever Carts for storage of bar stock type items. Each cart includes three pairs of arms. Arm height adjustable in 6" increments. Arms are secured to cart with a bolt and nut. Each arm features two holes so that it may be attached in the level or inclined position. Height of lowest arm position is 18-3/4", while the highest position is 60-3/4". The 10" high base includes built-in fork pockets that are 5-3/8"W x 2"H usable. Units roll on two (2) rigid and two (2) locking swivel 6" x 2" casters. 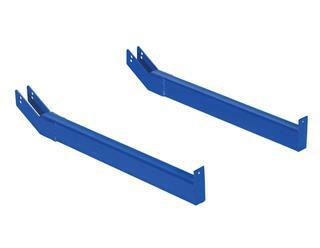 All steel construction with blue, baked-in powder-coated toughness. Extra Pair of 24" Usable Arms. Extra Pair of 30" Usable Arms.